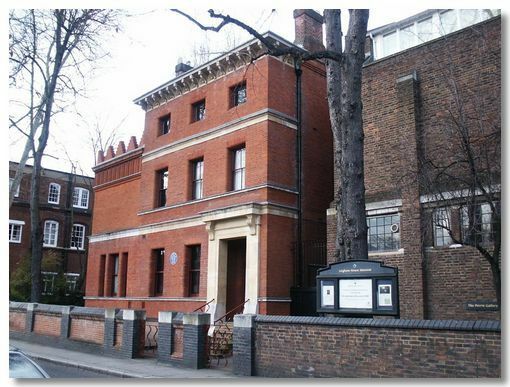 This house is a unique setting to see works displayed by Leighton himself as well as others, such as the Pre-Raphaelites, Millais & Burne-Jones. The Royal Borough of Kensington & Chelsea website. When you have finished touring the house, do visit the nearby Holland Park - one of London's finest small parks. I have got to admit to a soft spot for Holland Park: in my student days, I often used to laze on its lawns. Frederick Leighton (1830 - 1896) was arguably one of the most influential late Victorian artists. He was the first (& only?) artist to be raised to the Peerage. However he didn't enjoy being Lord Leighton for long; he died the following day. He designed his house in Kensington in the mid 1860's to be "The House Beautiful" and filled it with many of his artistic treasures. It is a gem of museum. The Arab Hall is the most famous room here.